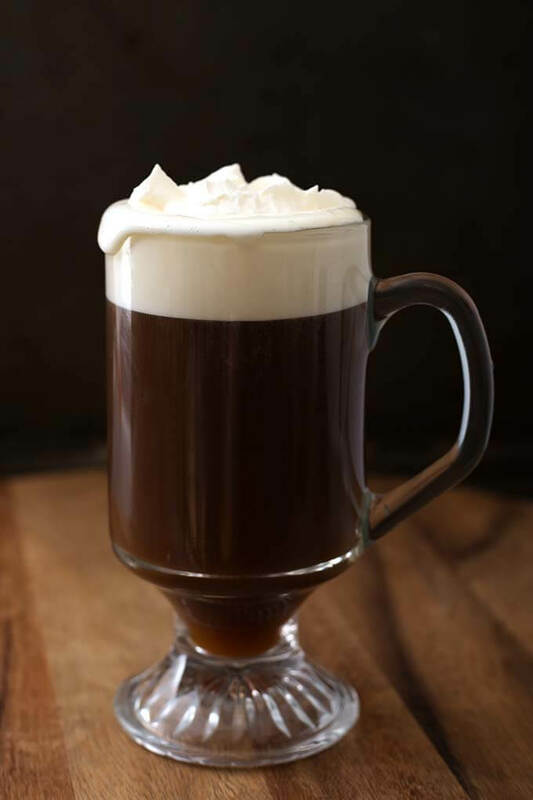 Enjoy this delicious Classic Irish Coffee Recipe on a cool evening, or a special gathering. We like to drink Irish Coffees during the Holidays, and when we are inside on a snowy day. This is the original Irish Coffee recipe. Adding a “wee dram” of whiskey to a mug of coffee is not a new thing, by any stretch. I remember my Grandpa having some at Christmas. 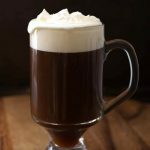 The Classic Irish Coffee is by far the most popular coffee “hot cocktail” that I know about. This tasty hot coffee cocktail was made famous in America by a man named Stanton Delaplane, who was a travel writer. It all started on the night of November 10th, 1952. 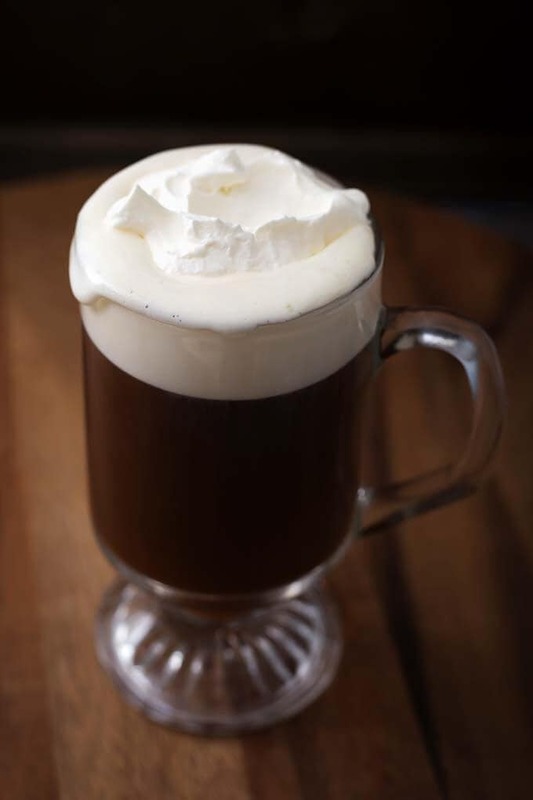 Jack Koeppler, who was the owner of the Buena Vista Cafe in San Francisco, California, challenged Delaplane to help him recreate a much loved “Irish Coffee” that was served at Shannon Airport in Ireland. Delaplane agreed to help, and he and Koeppler started to experiment. Things were going well, except that they had trouble getting the cream to float on top of the coffee (called a “collar”). They went to see the Mayor of SF, who happened to be a dairy owner. He figured out that if he aged the cream for two days, and only lightly whipped it, the consistency was perfect and floated on the coffee and made the perfect collar (‘collar’ is the top layer of cream)! As with other layered cocktails, it helps the layer stay on top if you use a spoon to break the stream of the cream as you pour it. Just hold the spoon over the glass (upside down, or domed side up) and pour the lightly whipped cream over the spoon. It’s Irish Coffee, so an Irish Whiskey is best! 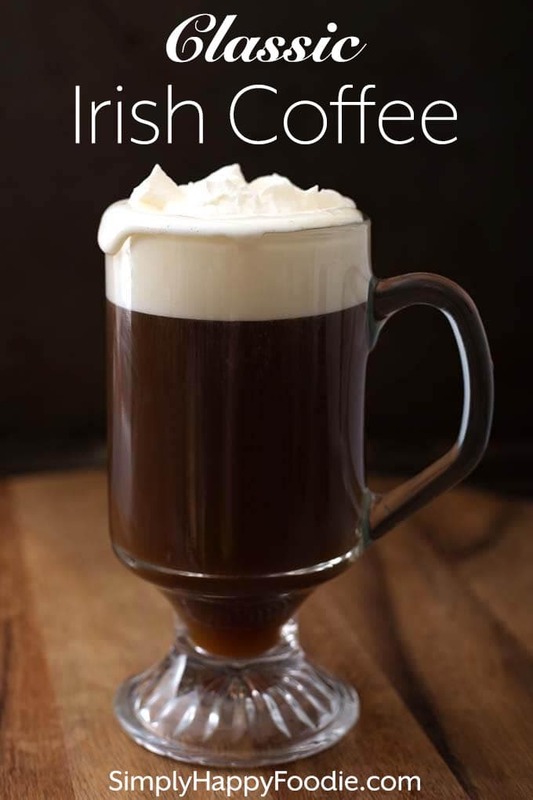 Enjoy this delicious Classic Irish Coffee Recipe on a cool evening, or a special gathering. We like to drink Irish Coffees during the Holidays, and when we are inside on a snowy day. This is the original Irish Coffee recipe from the Buena Vista Cafe. Fill an Irish Coffee glass mug with hot water, and let it sit for a couple of minutes. Then dump out the water. Add the hot coffee and sugar cubes, and stir until sugar is dissolved. Top with about an inch of lightly whipped cream. (pour it over the back of a spoon that is over the glass to get a nice collar/layer). Sprinkle a dash of cinnamon and/or nutmeg on top for a little extra spiciness (optional). *I also enjoy making Irish Coffee with brown sugar, as it has a warm flavor. This recipe is perfect. We didn’t have the whiskeys you mentioned but it was still really good. Our friends loved them. That’s great, Trey! Thank you for your review!